Riprap stone is the most affordable and effective method for protecting your shoreline from erosion, both now and long term. 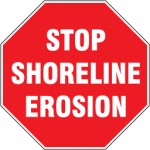 Shoreline erosion progresses each year without any structure to protect it. Riprap stone provides that structure. Ambiance Gardens has installed millions of pounds of riprap, both residential and commercial. We routinely perform services for Indianapolis’ largest property management companies, HOAs and individual homeowners. Our efficient process enables us to install tons of stone at your shoreline while doing little to no damage to your turf.